In the middle of desert nowhere, a tire comes to life and uses its psychic ability to make heads explode. Nearby, an audience of nitwits watches the action through binoculars. The tire becomes obsessed with a beautiful woman (Roxane Mezquida) in a Volkswagen and trails her to a decrepit motel. To his credit, Dupieux has made a marvelously intricate and witty movie that poses a passel of burning questions to its audience. (That would be you and me. The audience with the binoculars has been poisoned with bad turkey—except for the guy in the wheelchair played by Wings Hauser.) 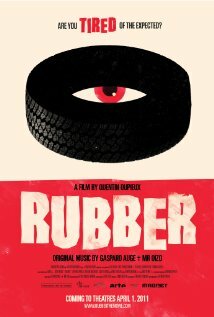 It would be easy to dismiss Rubber as absurdist twaddle with a side of pretension, but it’s filmed so cunningly through low-angle cameras that roll us right along with the murderous tire, that it becomes a brutally hypnotic experience. And by then, it’s too late. Unlike similar exercises in reflexive filmmaking by Dupieux’s highbrow cinematic forebears (Godard and Wenders come to mind), Rubber maintains a much-needed sense of its own playfulness that keeps the whole business from sinking under the weight of its concept. Even while some of the characters ponder the reality of the situation as if they were in a staged reading of Rosencrantz and Guildenstern Are Dead, Dupieux seems to be more interested in why we’re still watching this nonsense. You see, Monsieur Director, as nonsense goes, Rubber is hard to ignore. Will there be a sequel with the tricycle? Let’s dispense with the chit-chat and get down to the Nitty Gritty Dirt Band: Whether you see it as Night of the Demon (the full-length British feature) or Curse of the Demon (the American version with 12 minutes edited out), you’re in for a sweet ride. 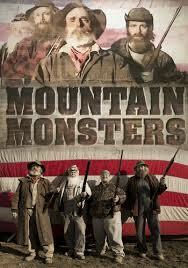 Based on the M.R. James short story “Casting the Runes” this black-and-white creep-a-thon is required viewing in the horror canon—and if your tender sensibilities can’t fathom a scary movie without a shower scene or diced camper, then I suggest you move on. Karswell coolly informs Holden that he will be taking a dirt nap in three days, prompting the spooked shrink and his comely sidekick (Peggy Cummins) to race around the English countryside in search of a solution. 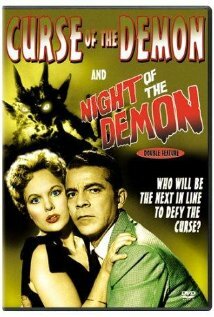 Credit the skills of veteran director Jacques Tourneur for creating a true atmospheric classic. Demon, as well as previous films such as The Cat People, I Walked With a Zombie, and the noir masterpiece Out of the Past (Robert Mitchum’s best movie? It’s up there) demonstrate Tourneur’s finesse with unexpected camera angles and his juggling of light and shadow to create menace. The attendant legend of Demon concerns the studio’s decision to have a demon appear at the beginning and end of the film, contrary to the wishes of Tourneur. IMHO, it would have been a fine movie without it, but I actually appreciate the effort to give viewers a nightmare they can take home with them. It’s really not a bad demon; I’ve seen much worse.